In my 2011 Pulchronomics 101 piece, I wrote about whether or not there was an advantage for women in media who were deemed attractive. Based on a Newsweek survey, the study found that attractive women had a greater advantage at work or finding jobs more so if they wore form fitting clothing. At the same time they can be punished for being too good-looking. My analysis goes deeper with Media Babes, where I talk about how broadcast ratings and sexier-dressed female anchors compare. FOX’s anchors wore the sexist clothes and therefore, based on my research, had the highest ratings. But apparently there is a double-edged sword, considering FOX is in hot water (yet again) with sexual harassment accusations. Another powerful man from FOX has been accused of alleged sexual harassment, Bill O’Reilly. Former CEO and chairman Roger Ailes was dismissed in 2016. 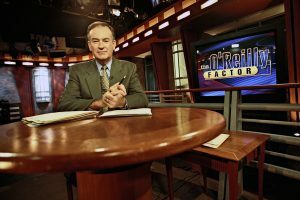 O’Reilly is the top-rated host of the network with his show the O’Reilly Factor, a programming bringing in roughly four million views nightly and about $44 million in advertising from 2014 through 2016. Due to these recent accusations, at least 21 advertisers have canceled contracts, including BMW, Hyundai, Mercedes-Benz and Allstate. Five women have come forward: former producers of O’Reilly’s show of Rachel Witlieb Bernstein and Andrea Mackris and former on-air personalities Rebecca Gomez Diamond, Laurie Dhue and Juliet Huddy. While he has denied any wrongdoing, there has been a total of $13 million in settlements paid by FOX or O’Reilly himself. While the women settled out of court by taking the total amount, they aren’t working in their field anymore. Noreen Farrell, Executive Director of Equal Rights Advocates, told the PBS NewsHour, “I think that sexual harassment very much remains the price of a paycheck for women across the country in hundreds of industries, no matter if they’re a low-wage worker or a high-wage worker, which we have seen a lot of news about.” She continued, “I think that when people talk about sexual harassment, they minimize it to a particular occurrence or one day or a bad act. But what we have seen from the fact that these women are not in TV news is that it can impact the entire trajectory of somebody’s career, which has an incredibly chilling effect on more women stepping forward. And so, from our perspective, the fact that these women are not — no longer in the industry is as problematic as the fact that they were harassed in the first place, because clearly retaliation and blacklisting is in play, not just in news, but in many industries.” Meanwhile, Ailes gets a $40 million severance package and O’Reilly is still working. So let’s get this straight: Men accused of sexual harassment receive huge severance packages or are still employed, while the victims are possibly blacklisted and get a small settlements. Appalling. 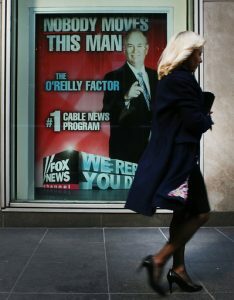 Top Photo: Outside the Fox News studios in Manhattan on Wednesday.